Tea Trees ( Leptospermum, MYRTACEAE ). When ready to pupate, it attaches itself to a leaf by a cremaster. The pupa when formed sticks out from the leaf, unprotected by a cocoon. 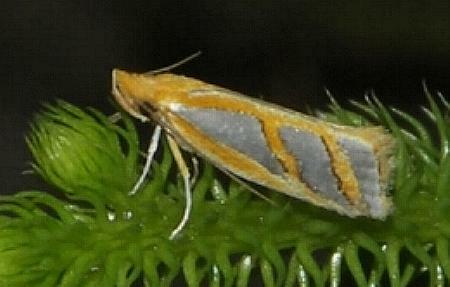 The adult moth has satin white wings, with two brown diagonal stripes and a brown border around each fore wing. The moth has a wingspan of about 2 cms. Moths of Australia, Melbourne University Press, 1990, pls. 4.5, 24.3, p. 236. Series 2, Volume 7, Part 4 (1893), pp. 574-575, No. 146.